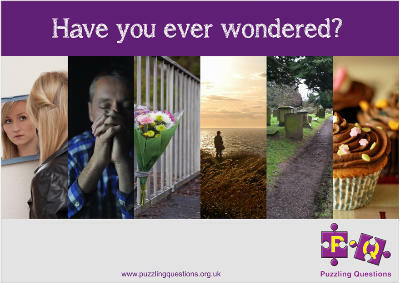 We’d like to invite you to join us on the next “Puzzling Questions”, a course for people exploring faith. This has been run in Belper Parish several times, and it’s had a big “thumbs up” from everyone who has been on it so far. It’s designed to run in groups of about eight people; there are six sessions. The course starts with an introductory meal, making seven evenings in all. As well as the watching and listening that’s part of each session there will be plenty of opportunity for discussion, or to just sit back and take it all in, if that’s what you prefer. Whether you have already given these matters lots of thought, or whether this is something completely new to you, you will be welcome. The course is completely free of charge. The only commitment we ask is that you let us know if you cannot make a session. And if Puzzling Questions is really not floating your boat and you want to drop out – that’s fine. Do you have a friend who'd like to find out more about Jesus? Are you looking for answers to life's big questions? The Alpha course is an opportunity for anyone to explore the Christian faith in a relaxed, non-threatening manner over ten, thought-provoking weekly sessions. It's low key, friendly and fun. You're not on your own either. More than seven million people worldwide have found it a worthwhile experience, completing the Alpha course in churches, homes, schools, universities and prisons. So if you would like to know more about Alpha or are interested in finding out more about the Christian faith, why not consider coming on our next Alpha course? 3. A Discussion - this is your opportunity over coffee to discuss what you've heard, share your views and ask anything you would like. Please contact us to find out when the next course will run. If you would like to attend a course please complete this registration card that is also available in Church and return it to the office.